"Dirty Gold War" is a fable about gold and the reality that lies beneath a sacred metal associated with love and celebrations. Through protagonists such as Raoni Metuktire or Marco Arana, the film opens our eyes to the devastating gold rush sites, deep within Amazonia. This film reveals important issues about a gold rush that is continuing in the 21st century, in silence and indifference, regardless of the interests of indigenous peoples and of our planet. Both the mining as well as the further processing of resources such as gold can cause serious damage to nature. In addition to the environmental damage, mining of gold also affects the life of the indigenous population. As "Dirty Gold War“ is the only film we know treating this issue, we recommend watching it. Aside from that, it draws many connections to Switzerland, which is the worldwide largest importer of gold (2 500 tons per year). "Dirty Gold War“ reveals the dirty side of gold. Based on very good journalistic research, the film illuminates the lack of transparency of the commodity markets. The film explains contexts clearly and draws many connections to our daily lives. "Dirty Gold War“ points out to an issue that most people are hardly aware of and that is, nonetheless, very important. 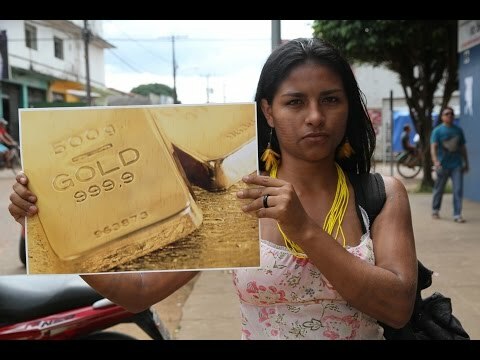 The film very impressively shows the disrespect for human rights and the environmental destruction with examples of the gold mining business in Peru. Focusing on the social impacts of gold mining, "Dirty Gold War“ is deeply touching and encourages to reflect on this issue. However, the film lacks to offer solutions and to encourage to take action. "Dirty Gold War“ presents unique pictures and scenes, is well structured and easy to follow. However, the technical performance is quite moderate: the film is not very exciting; cut, camerawork and soundtrack are good.